This time I used the sketch over at Retro Sketches as a jumping off point. I rotated the sketch, and then I chopped up the main panel for a tiled effect that I quite like. 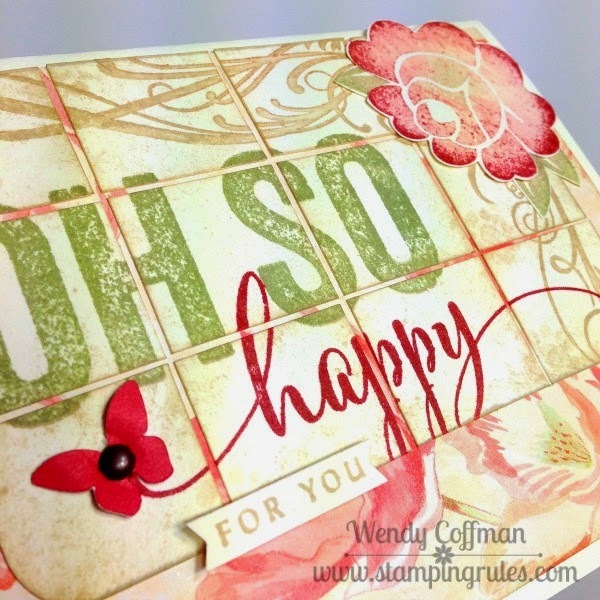 I stamped the main panel with Cashmere, Garden Green, and Cranberry inks. My panel was 4 1/2 x 3, so I cut it into three 1" strips and then I turned the strips and trimmed the squares at 1 1/8". For my corner flower I inked the bloom in Cashmere ink, then rolled just the edges in Cranberry ink. 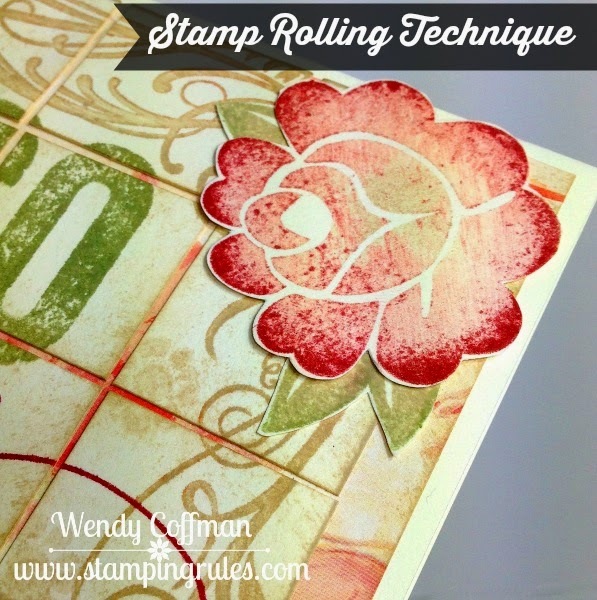 I stamped that off onto scrap paper, then rolled just the tips of the petals around in more Cranberry ink before stamping onto Colonial White cardstock. That gave me a really nice variegation in the petal coloring without a lot of complicated coloring! I did the same with the leaves for the flower, inking first in cashmere and then rolling it in garden green ink before stamping. I'm Oh SO Happy that I'll be headed to Seattle in just two days! I hope you've got something that makes you Oh So Happy today too! I love this card, Wendy. I too was just using up some of my Elegant Bouquet. I am filling that empty space with Blossom paper, right now!